A pump drains Mattole Canyon Creek to water marijuana crops. Two busts east of Garberville yesterday turned up just the kind of ecological havoc that's been infuriating environmentalists and getting the attention of our Congressman. Along with the usual guns, greenhouses and greenbacks ($198,000 at one property) Fish and Wildlife say they found pumps draining Mattole Canyon Creek, sucking up salmon and steelhead smolt, and leaking oil on the riverbed. On 08-27-2013, approximately 10:00 a.m. the Humboldt County Sheriff’s Office and Humboldt County Drug Task Force assisted Game Wardens with the California Department of Fish and Wildlife with two search warrants in the Dutyville area of Humboldt County. Fish and Wildlife Wardens had received complaints regarding the dewatering of Mattole Canyon Creek which is a spawning ground for Salmon and Steelhead. A Fish and Wildlife Warden obtained a Humboldt County Superior Court Search Warrant after learning of stream diversion and water pollution occurring near two parcels of property. Officers went to the two different locations and served the warrants at approximately the same time. One of the locations was in the 1800 block of Dutyville Road. When officers arrived they located two people at the residence, Bruce Wayne Turner, 63 years old and his 56 year old girlfriend. Officers located a pump in Mattole Canyon Creek which was being used to pump water to the marijuana plants the couple was growing. The pump was pulling water from pools where Salmon and Steelhead Smolt were living causing the water level to drop and water temperature to heat up killing the young fish. Officers also saw there were places near the intake pipe where there was live fish. The Wardens also believed the pipe was sucking in and killing the Smolt. The officer’s located where oil was spilled in the riverbed near the pump and saw where the suspects were storing oil and gas cans in the river bed. Officers located 877 growing marijuana plants located in two greenhouses on the property. The plants ranged in size from approximately 8” to 6’. 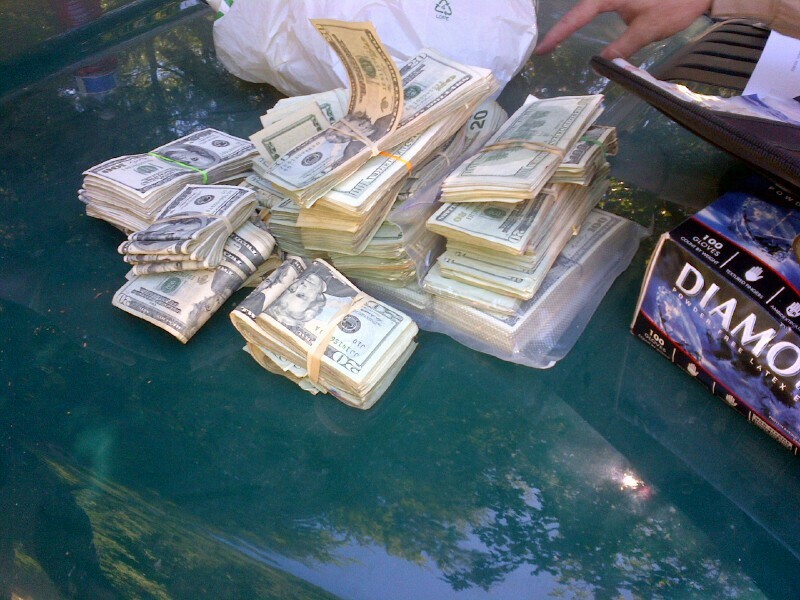 They also located approximately $198,000.00 in cash, scales and evidence the marijuana was being sold for profit. Turner was arrested for cultivation and possession for sale of marijuana, allowing a place for drugs to be stored (all felonies ) and Fish and Wildlife code violations for altering a streambed without a permit and polluting a streambed ( both misdemeanors ). He was transported to the Humboldt County Correctional Facility where he was booked and his bail was set at $50,000.00. Turner’s girlfriend was not arrested due to health issues. Charges are being sought against her through the Humboldt County District Attorney’s Office. 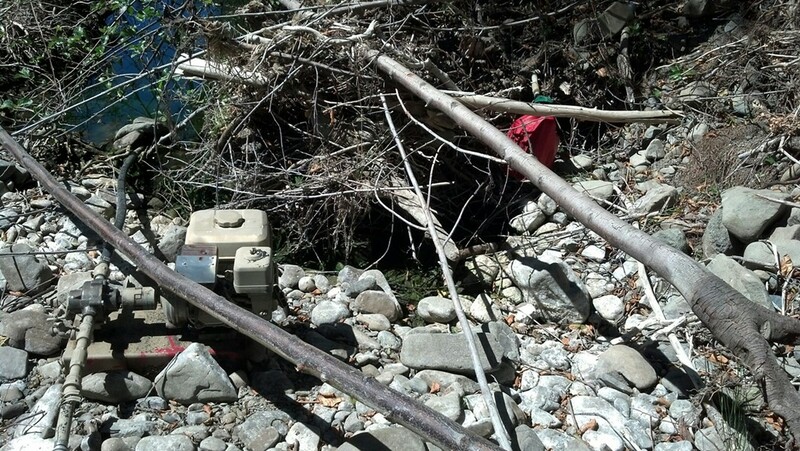 At the second location in the 3100 block of Dutyville Road, officer’s located another pump in the Mattole Creek riverbed removing water from the creek to water marijuana plants. That pump was also creating the same environmental issues and damage as the first location. Officers located a 59 year old male and his 56 year old wife living on the parcel in a residence. Officers searched the property and located 172 growing marijuana plants in two greenhouses ranging from 1’ to 6’ in height on the property. They also located approximately 4 lbs of marijuana bud and 25 lbs of processed marijuana along with four handguns, one shotgun and two rifles. Charges are being sought against the couple through the Humboldt County District Attorney’s Office for cultivation of marijuana, possession for sale of marijuana, allowing a place for drugs, possession of a loaded firearm in the commission of a felony stream diversion and polluting a stream. They were not arrested at the time due to logistical issues with transporting them to jail.